Duck Tales Release Date, Woo-ooo! Update: 4/2/11 The Art of Disney DLR page had this graphic and confirmed the price as $26.95. Also worth noting, the small print saying “2 sets per guest, per day”. Update: 3/25/11 Disney Events page officially posts the April 8th release date we announced earlier in the week. Thanks to J for pointing it out. It looks like both the FL and CA D-Streets will get the Duck Tales combo pack. It is NOT listed as being released online. Set your alarm clocks and we will meet you out there before dawn. What time will you line up? 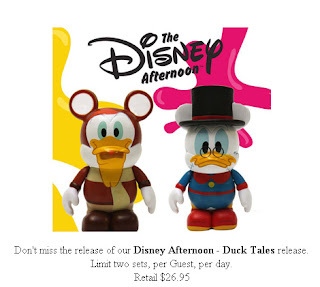 Thanks to Ryan, the newest addition to the DV team, we have a release date for the Duck Tales combo pack from the Chris Chapman designed Disney Afternoons Series. Expect to see Launchpad and Scrooge McDuck on April 8th. The only question is where? The release date info was uncovered at the WDW Trading Event this past Friday night. One Disney cast member said it would be released at D-Street, while the other said at the Disney Store Online. A Disney Parks Blog post back on March 1st said that all future Disney Afternoon releases after Tail Spin would all be at D-Street. The Tail Spin set retailed for $26.95, so we can expect the same price here. It also looks like the Disney Afternoons cartoon series will be released one combo set at a time. What do you think about this release info? Which is your favorite Disney Afternoons set. Check out our Disney Afternoons page here. I’m very dissapointed that this, & from what I understand the rest of the Afternoon packs, will not see an online release. With 1000 sets available there are more than enough to have some sets online. I”m lucky to make it to WDW once a year, can’t plan it around a Vinyl release.